Celebrating women and minorities in technology. As we celebrate International Women’s Day, on the 100th anniversary of voting rights for women being passed, it is important that we still acknowledge areas where women and other minorities are still fighting for equality and acceptance. Let’s get straight into this! My name is Francesca Clarke, I am a Training and Change Co-ordinator for Netpremacy Ltd, a Premier Partner of Google Cloud. 2 years ago, I made the move from working in finance to technology. It was the best decision I ever made however, sadly I am part of a minority. Of those working in tech industries, only 17% of the UK technology workforce are women. It is clear that there is an obvious divide between sexes within the technology sector, however, it appears that the gap is closing! 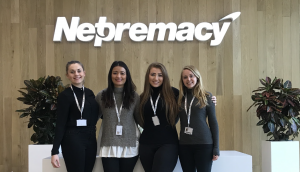 Over the 2 years that I have been working for Netpremacy, we have doubled the female workforce, and have found talented women who are eager to learn and grow within the business. For all genders, I believe that there is a common misconception that you need to be a technical genius in order to gain employment within the technology industries. Nevertheless, there are many career options that keep businesses such as ours flourishing worldwide. Aren’t the only jobs on offer for programmers and developers? Tech companies are like any other, they need all the relevant cogs to keep the machine working. These roles include personnel in the obvious roles of Technical, Support Engineers, and Developers. But also include divisions such as Marketing, Accounting, Change Management, Training, Business Analyst, Project Management, Sales and more. You could already have experience in one of these roles or be looking into changing career path into one of these fields. Moving into a different industry can provide the motivation you are craving, and as the saying goes ‘a change is as good as a rest’. It is your employer’s duty to provide you with the information and skills you need to flourish. Although don’t forget it’s down to the individual to take an active role in their own independent learning in order to be successful. Learning new skills is an area where women can often outshine men. In the past women have been pigeonholed by their ‘maternal instincts’ and an ability to ‘nurture’, meaning they have often been restricted by society and most importantly themselves when seeking employment. Instead, we should look at these characteristics and what they can bring to a role. As equal opportunities in the workplace have become standard practice we now have to focus on the main barrier preventing women from covering new career ground, the mental barrier of ‘it’s no place for me’. I am a woman in a male-dominated industry and I personally find it brilliant! Every workplace has it’s pros and cons but as more women are coming into the technology industry there have been major improvements from what some might call ‘a woman’s touch’. We are still outnumbered but women are rising up to the highly ranked positions and the only thing holding us back is our own perception of what is possible. “All my positions in tech companies have been people facing. I have found that women usually tend to work in people facing roles. I guess we have a tendency to be people oriented rather than working with ‘things’. In theory, more women in tech could change the direction of the industry by creating more choice & demand for solutions by approaching projects from a different perspective. Bernice touches on a common theme that can deter women from entering unfamiliar industries… the fear of being singled out or treated differently. When moving into a new company, there will always be nerves and hesitation as there is with any change, but I am in complete agreement with this statement, I have never been professionally singled out due to my gender. I am instead a firm believer that if I maintain to break ground at work and keep my standards high I will stand out for this reason alone. I asked the CEO of Netpremacy what his views on this subject were. Understanding how a person, regardless of their gender or upbringing, can bring vital attributes to a role, is about understanding that individuals should be seen for their personal and professional qualities. This is a question that every child has been asked at some point. I can easily say that I never responded with “a Training and Change Co-ordinator for a UK Premier Partner of Google Cloud”. In fact, if I had been told as a teenager that I would end up working in IT I would have laughed. At that point in my life, I didn’t have much of an interest in IT, and most importantly even though I was confident using computers I would never have labeled myself as overly skilled on them either. I made my career move to technology with my self-taught computer skills and built on my existing strengths and experience from previous employment. Almost instantly I had my eyes opened to new tools and through some basic training, a spark was lit that turned into a fire! I went out of my way to learn everything I could about this new area of work and whats more I was enjoying going to work every day for the first time in my working life. Now, some may say this is a little dramatic, however, my role has helped me travel the world and have experiences I’d never even dreamt of. I think like a lot of my peers, growing up I was never actively encouraged to learn more about technology. My parents were from a generation that associated ‘playing’ with mud, footballs, climbing trees and generally being outside. Nowadays playing on a games console, computer or mobile phone has redefined the definition of ‘playing’ for present and future generations. Children are now being taught coding in the first few years of their education. Making IT an accessible future career for all no matter their gender or background. Tablets are now becoming a common fixture in a child’s school bag and tech of all kinds is replacing paper and pen. Our dependency on technology is something that has to impact the ratio of men to women in tech, but like any advancement, it may just take a little time. Is the industry that speaks binary soon to become non-binary? We certainly think so! If you are interested in a career at Netpremacy head to our careers page to find out more. * “New UGA research helps explain why girls do better in school – UGA ….” 2 Jan. 2013, https://news.uga.edu/why-girls-do-better-in-school-010212/. Accessed 6 Mar. 2018.